Although operative since 1925, the origin of the Ritual dates back to 1922. The engineer Herbert Haultain, a mining engineer and teacher at the University of Toronto, then President of The Engineering Institute of Canada, brought up the idea that in some way, esprit de corps and social responsibility should be promoted between engineers. At a dinner meeting in Toronto, he suggested that commitment could take the form of an oath of honour. Herbert Haultain 1869-1961 “The Ritual of the Calling of an Engineer has been instituted with the simple end of directing the young engineer towards a consciousness of his (her) profession and its significance, and indicating to the older engineer his (her) responsibility in receiving, welcoming and supporting the young engineers in their beginnings”. The idea of an iron ring to be worn on the small finger of the “working hand” originates from a proposal of the founding committee. Kipling was pleased with the idea and suggested that the ring should be rough, …as the young engineer’s mind…, and have a hammered finish to evoke the difficulties that the engineer will meet in his quest to master matter. In addition, Kipling recommended the symbolic use of a hammer, anvil and a chain held by the candidates while pronouncing the obligation. The chain symbolizes that engineers should remain tied with a moral obligation to help society and one another. The seven engineers decided to set up the “Corporation of the Seven Wardens”, a non-profit organisation with the trustee and administrative responsibilities for the Ritual. Since 1925, 25 Camps have been set up across Canada to perform that role. The first ritual took place in Montréal on April 25 1925, to obligate the founding engineers who formed the initial Corporation of Wardens. During the same year, the first local Camp was set up in Toronto, where a second ritual took place on May 1st, with 14 local engineers, of which seven became Wardens of this Camp. On the 25th of April 2000, Canada Post published a stamp to commemorate the 75th anniversary of the tradition. 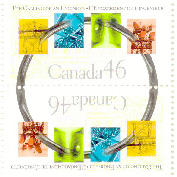 The stamp shows a hammered iron ring connecting the images of some of Canada's greatest engineering accomplishments.